Fleetwood manager Joey Barton has piled the pressure on Sunderland ahead of Saturday's game at the Stadium of Light. The Cod Army moved up to sixth in League One last weekend after recording their first home victory of the season, despite Wes Burns' red card in the first half. And Barton believes his side have more than enough to defeat the Black Cats, who will be under pressure to perform on home turf. "On the pitch is where it matters, and I don't see a David v Goliath. If anything, I see us just better than them, man for man," said Barton. "If anyone doubts our spirit, they just have to watch the Bradford game. To win with ten men, it was special. 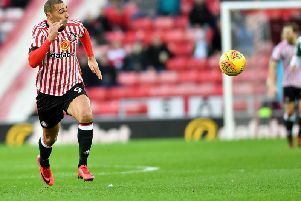 "Credit to Jack Ross, he's got the fans coming back to the stadium and the team winning games. It's not easy to turn around a club which has a habit of losing, no matter what resources you have. "I think Sunderland have more to lose in front of their home fans than we do." Barton played against Sunderland for Newcastle but insists Saturday's meeting is just another game. "I've been there as a player and played derbies at Sunderland. It's the same as playing another big club like we did against Bradford. "The weird thing is that there will be more people in the stadium on Saturday, than there will be in the whole town of Fleetwood! "We know it will be a good competitive fixture, and one that we're really looking forward to."